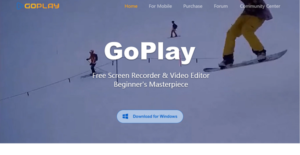 GoPlay is a comprehensive video capture and editing software ideal for any user types that are looking to record their screen, gameplay, and webcam in high-quality video format. The software lets users edit their videos to their heart’s content with a plethora of tools, including split and merge, music and sound effects, Picture-in-Picture, multi-audio mixing, and real-time dubbing to mention a few. Dubbed by many tech review sites as one of the best video capture and editing solution today, GoPlay boasts of user-friendliness that makes it easy to use even for novices and flexibility that allows for recording, editing, and sharing even when on the go using mobile apps for Android and iOS. GoPlay Editor’s screen recorder provides you with a rich set screen recorded features and modes, like area mode, full-screen mode, and PIP screen capture mode. Each mode lets you capture specific areas of your screen, webcam videos, mic audios, and more. This massive feature selection makes it easy for you to create the perfect video for whatever purpose or project, whether you are creating tutorial videos and first-person action videos among others. You can add video and sound effects with ease and be in control of the quality aspects like resolution, frame rates, and brightness to enhance video quality. Subtitles are crucial for today’s videos, especially if you want your viewers to really comprehend your videos better. With GoPlay, you can easily add subtitles and captions to your videos in a few clicks. In the future, GoPlay will speed things by leveraging speech-to-text technology. This capability will automatically match the voice and the tone of the audio track or dialogue, making captioning quick and easy. Editing your videos is a breeze as GoPlay provides you with multiple video editing tools like video effects, split and merge, text and text effects, and background music among others. Once your videos are ready for sharing or public consumption, you can easily post them on your websites or social media accounts or share them to your circle of loved ones and friends via messaging platforms and email. What Problems Will GoPlay Solve? Uploading a video to YouTube is easy. Creating a great video is another story. WIth GoPlay, you can create high-quality videos complete with special effects, texts, captions, and more. The software is loaded with a rich set of editing tools to help you craft professional-looking videos with ease. Many people need to download and use a different software for recording, editing, adding captions and more. With GoPlay, you only need one solution to perform all these things and more. Many video editing products are expensive and many of them require you to purchase additional or supplemental modules so you can add more features. GoPlay has all the features you need at a price that you can afford. If you are considering GoPlay it might also be a good idea to examine other subcategories of Best Video Editing Software gathered in our database of SaaS software reviews. Enterprises have unique needs and requirements and no software application can be ideal in such a scenario. It is pointless to try to find a perfect out-of-the-box software system that fulfills all your business requirements. The smart thing to do would be to modify the system for your special wants, staff member skill levels, budget, and other elements. For these reasons, do not hurry and pay for well-publicized popular systems. Though these may be widely used, they may not be the ideal fit for your unique needs. Do your groundwork, look into each short-listed system in detail, read a few GoPlay reviews, call the vendor for clarifications, and finally choose the application that provides what you need. How Much Does GoPlay Cost? We realize that when you make a decision to buy Video Editing Software it’s important not only to see how experts evaluate it in their reviews, but also to find out if the real people and companies that buy it are actually satisfied with the product. That’s why we’ve created our behavior-based Customer Satisfaction Algorithm™ that gathers customer reviews, comments and GoPlay reviews across a wide range of social media sites. The data is then presented in an easy to digest form showing how many people had positive and negative experience with GoPlay. With that information at hand you should be equipped to make an informed buying decision that you won’t regret. What are GoPlay pricing details? What integrations are available for GoPlay? If you need more information about GoPlay or you simply have a question let us know what you need and we’ll forward your request directly to the vendor.